Researchers from the Instituto de Astrofísica e Ciências do Espaço (IA) are touring Portugal and bringing the Universe to towns and cities away from the main urban areas. 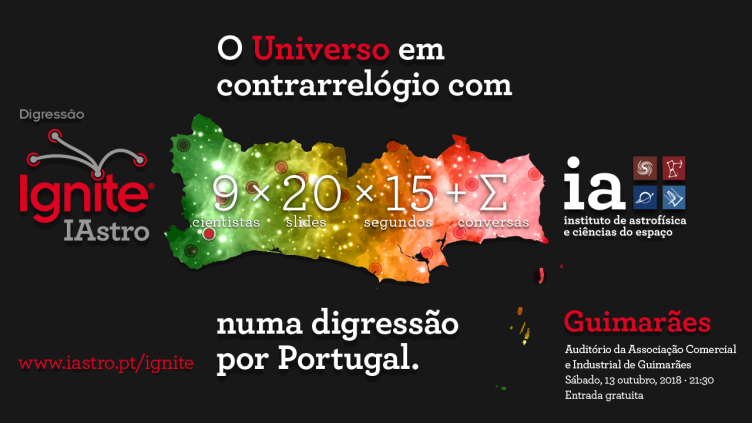 The Ignite IAstro format allows the presentation of about ten different research topics in space sciences in Portugal in an accessible and amusing format. We will travel from the stars to the galaxies and to the edge of the Universe, at the same time introducing the instruments that enable us to get that far. In each Ignite IAstro event, eight to ten researchers from the Instituto de Astrofísica e Ciências do Espaço present their research in only five minutes each. Following the Ignite format, each researcher will have to speak at the pace of a sequence of 20 slides that advances automatically every 15 seconds.